Meets in odd months on the third Tuesday. 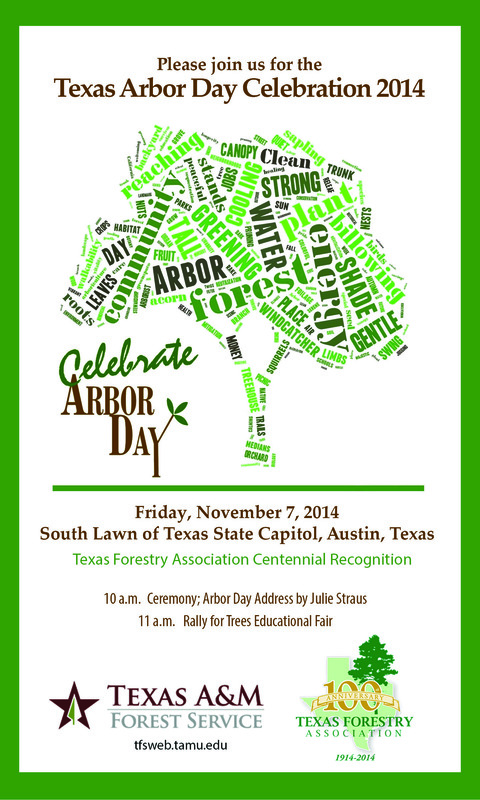 Texas Arbor Day Celebration is being held at our state’s capitol this year featuring Julie Straus, wife of Texas House Speaker Joe Straus and tree advocate, as our guest speaker. The celebration will feature a ceremony with a tree planting followed by Rally for Trees educational fair with educational booths, games, giveaways and more. We invite the media and the community to celebrate trees and the vital resources they provide us every day. 300 bur oak seedlings will be given away. In the field training designed to bring you to the next level. Through a systematic, stepped approach, students are taught not only on the how, but just as importantly, the why behind the methods. Professional instructors define, analyze and explain the benefits and features of techniques and equipment. The students hands-on experience and practicing under expert guidance helps to solidify the learning experience. Urban Forest Steward is a series of workshops about urban trees organized by TreeFolks and Austin Urban Forestry. Drought, disease and habitat degradation take a constant toll on urban trees. Texas A&M Forest Service estimates that the 2011 drought killed more than 5.6 million urban trees across Texas. We believe that the more you know about trees, the more you’ll want to take care of the trees at your home and in your community. The goal of Urban Forest Steward is to equip you with the knowledge and skills you need to do just that! This year’s series is more exciting and in-depth than ever before, with topics taught by respected professionals from both public and private sectors. Pick and choose the sessions that are most interesting to you or take all 4 sessions to earn an Urban Forest Steward certificate and get the 2014 Urban Forest Steward t-shirt. Come hear from four Texas experts on practical ways to recognize and diagnose insect and disease problems in Texas trees. A great review or introduction to basic tree care for tree workers. A stand-alone one day workshop that will be a combination of classroom and filed demonstrations. Topics covered will include basic tree biology, tree pruning, ascent techniques review, tree hazard assessment, job site safety and chain saw operation and safety. Master instructors are Guy LeBlanc and Brad Hamel. A Spanish language workshop covering tree benefits, water management, pruning and tree biology. Expert speakers include Salvador Alemany, Armando Cortez, Dr. Raul Cabrera and Mark Duff. ISA has announced that the 2015 International Tree Climbing Competition will be help in Tampa on March 15, 2015. To accommodate this change, ISAT will be holding a Master's Invitational Competition in Waco in October. The top five finishers in the 2014 New Braunfels competition will be invited to compete. The winner will represent Texas at the 2015 ITCC in Tampa. The Greater Houston Plant Conference provides the perfect platform for the greenhouse & nursery grower, landscaper, retailer, collector and plant enthusiast to come together for a glimpse at exciting new plants. The Awards will be presented during the Awards Luncheon at the Texas Tree Conference in Waco on October 3, 2014. Celebrate the accomplishments of those who have dedicated their talents to spreading a leafy green canopy over Texas by nominating them for the 2014 Texas Community Forestry Awards Program. Do you want to make a difference in the tree industry? Run for office on the ISAT Board of Directors. You’ll get to meet many of the leaders in our industry and feel good about paying it forward. The commitment is a two year term. There are four board meetings per year plus an annual ‘Retreat’ where we kick off planning for the year. And, of course, the time you’ll put into coordinating your volunteer projects. A good board member is hard working, self motivated, dedicated and community oriented. We have seven seats open for the election. You can nominate yourself or another qualified ISAT member interested in serving on the ISAT Board. The Election Committee will fill the slate from the nominations. Elections will be held in August and the Board members will be installed at the annual membership meeting held at the Texas Tree Conference on October 3, 2014. Would you like to join the leadership of ISAT? Applications are being sought from the ISAT membership to fill seven positions on the ISAT Board of Directors. You may apply yourself or nominate another qualified ISAT member interested in serving on the ISAT Board. The Nominations Committee will select the slate from the nominations received. Elections will be held in August and newly-elected Board Members will be installed at the membership meeting held at the Texas Tree Conference in Waco on October 3, 2014. A form that can be filled-out and printed or emailed is here. The Texas Forest Service and the Texas Chapter ISA are hosting the Tenth Annual workshop for ISA Certified Arborists on how to identify and manage oak wilt. Each participant that successfully completes the training will be awarded a Certificate of Training Completion. This training will be noted on the www.texasoakwilt.org website as well as on any handouts and other material referencing qualified individuals. Dr. David Appel and TFS Staff Foresters will be conducting the training. Registration is limited to 30 and two per organization or business. The cities where we live are heating up, but the places where we live need to be cool. What makes a cool city? Green infrastructure, sustainable design, art, music, trails, walkability, greenways, complete streets, parks, open space, and really cool people. Managing urban heat in an increasingly hot and dry climate is necessary to protect public health, infrastructure, the economy and quality of life. Trees and green infrastructure are a priority for urban heat management, water quality, air quality and energy conservation. Mark your calendars now for this years contest. Winner of this year's competition will represent the Texas Chapter in the internationals in Milwaukee. This is the best event of the year for a working climber to attend if you want to improve your skills. Accidents involving brush chippers are a significant concern for tree care and landscape employers, the employees who operate the equipment, and manufacturers alike. With support from Altec Industries, Bandit Industries, Morbark Inc. and Vermeer Corporation, TCIA has created the new Chipper Operator Specialist credentialing program, designed to train tree care employees in hazards, as well as accepted practices for brush chipper operation and other associated tasks. For crew members who often do not receive formal training opportunities, the program will increase employee involvement with overall safety compliance and self-policing and provide crew members with an opportunity to earn a nationally recognized credential. Comes with the Chipper Operator Specialist manual and enrollment, a $35 value. This is an invitation to a tree care workshop being held in Amarillo on April 24th. We will be offering all 5 CEU’s from Texas Dept of Ag (including Laws & Regs) for applicators and 6 CEU’s from the International Society of Arboriculture for arborists. Lunch will be provided from Beef O'Brady's. We hope to see you there! It's time for the 4th Annual Bilingual Tree Worker Workshop in San Antonio. Come learn from industry leaders such as Eduardo Medina from Davey Tree, Jim Houser from Texas A&M Forest Service, Jacob West from Bartlett Tree Experts, and Mark Bird from City of San Antonio. We will discuss professionalism in arboriculture, tree biology, pruning, and oak wilt. There will be demonstrations on air spades, chainsaw safety, large tree pruning and removal, and young tree pruning. We hope to see you there. Do you want to stand apart from the crowd, take your arboricultural career to the next level, and add to your growing list of credentials? If so, then the ISA Texas Chapter Master-Series All You Need to Know About Bugs in the Landscape Workshop is for you! This one day Workshop will introduce the world of insects to the practitioner. The program will start with the basics on what insects are made of and what makes them work. Then you will be exposed to the tremendous diversity of insects. From there, we will delve into specifics on pest insects and arthropods one may find in the landscape. Categories and severity of damage will be discussed, as well as identification of plant symptoms. Next, you will be introduced to nuisance biting and stinging arthropods, followed by the wonderful world of the Good Gals, or beneficial bugs. The afternoon session will include a practical, outdoors sleuthing of landscape plants to apply knowledge learned from the morning session. Finally, the program will conclude with an overview of the types, modes of action and proper use of insecticides. 2014 Texas Wildlife & Woodland Expo and Spring Fling. Volunteer opportunities for Texas Master Gardeners and Texas Master Naturalists. Badge opportunities for boy scouts and girl scouts. Kayaking Skills Tank (skills and safety) • Archery (skill and safety) Fly Fishing • Rod & Reel fishing (fishing/boating safety) Jakes Take Aim BB Gun Range (gun safety) • Hands on crafts with lessons Baytown Nature Center touch tank (aquatic) • GPS, Orienteering & Compass Wildlife-live animals (wildlife) • Wolves of St Francis (rescue/rehabilitation) Dutch Oven Society with History (history). Proper care and maintenance of trees, from planting onward, will assure long-term health and good structure, maximize the benefits provided by urban forests while reducing risk, and minimize interference with infrastructure. This workshop will review how A300 standards are used for: -Writing specifications for all aspects of tree work -Developing training materials for employees and volunteers involved with tree care -Assuring a clear understanding of proper tree care for regulators, governments, and legal authorities. Workshop is $25 and the price includes a free ANSI A300 Part 1 Pruning standard, 3 ISA CEUs, and 0.5 CTSP CEUs, and morning refreshments. The Texas Chapter of the International Society of Arboriculture is seeking proposals for presentations for the 35th Annual Texas Tree Conference, to be held in Waco, TX October 1-3, 2014. This year, the theme of the conference is "Surviving ExTREEmes" The Tree Conference attracts commercial and consulting arborists, municipal and community foresters, utility foresters, landscape architects, urban planners, and other professionals from related fields. Attendees have a wide variety of experience, from university students to well-salted veterans. Proposals will be evaluated based on overall quality, appropriateness and timeliness of topic, well-defined, focus, practical application of material, and the subject’s interest to a diverse audience. Only proposals submitted online will be accepted. The deadline for submissions is Friday, March 14, 2014. If you are interested, please fill out the online application here. The go to source for continuing education for municipal and commercial arborists in North Texas is pleased to present Dr. Ed Gilman, University of Florida. A three time graduate of Rutgers University, Dr. Gilman has a 45% research: 50% extension teaching: 5% classroom teaching assignment. His new online arboriculture class is available to students world-wide. He works with arborists, consultants, landscape contractors, growers, urban foresters, planners, landscape architects and others engaged in tree selection, growing, planting and management issues. His research includes tree pruning, anchorage, roots, irrigation, and fertilization. Climbers - want to improve your climbing skills? It's time to learn from the best! Basic Climber Training is the first of a series of three workshops intended to teach tree climbing, pruning, and aerial rescue techniques. This first course will focus on basic climbing techniques and working in a tree. Topics will include site assessment, job planning, equipment, safety, ascent techniques, work positioning, pruning and cutting techniques, and aerial use of a chain saw. The second class in the series will focus on aerial rescue, and the third on advanced climbing techniques, including SRT. There will be an introductory classroom segment followed by outdoor instructor demonstration and hands-on participation by students. As the most comprehensive training experience for arborists who consult, the Consulting Academy includes interactive sessions and lectures on all aspects of consulting arboriculture. ISA are now accepting volunteers for the 2014 North American Tree Climbing Championship to be held April 5-6, 2014 in Pasadena, CA. Sign-up by March 1. It’s time to start getting your team together for the 2014 HAUFC Tree Planting Competition. The Houston Area Urban Forestry Council is in the process of planning the 2014 Tree Planting Competition, the date will be Saturday February 1th (Saturday February 8th will be the alternate rain date). The planting competition once again will be held in partnership with Harris County Flood Control District, but we have added CenterPoint Energy and Trees For Houston as additional sponsors. The planting location is a large detention basin at the corner of W. Little York and Hollister. As in years past there will be Professional, Amateur and Youth Divisions and HCFCD will prepared the site beforehand. The rules will be the same as in years past but because this event has grown over the years we anticipate more teams participating this year. This year we will also have door prizes, raffle items and every volunteer will also get a t-shirt. Former students say the quality of teaching was excellent and the course was very informative and appreciated the attention to real world issues. Attendees routinely score significantly higher than the national average on the Certified Arborist Exam. Texas A&M Forest Service is offering an unique opportunity for landscape, horticulture, ground maintenance and tree care businesses and workers desiring to gain a straightforward understanding of tree care from the roots on up.